Methane Clathrate Gun: Pea-shooter or Bazooka? Here is the first of six videos. ‘Will Methane Clathrate Gun Only Fire Blanks?’ // Published on Feb 10, 2017. Will a huge burst of methane gas be released from hydrates/clathrates in the Arctic as abrupt climate change takes out the sea-ice and snow cover? 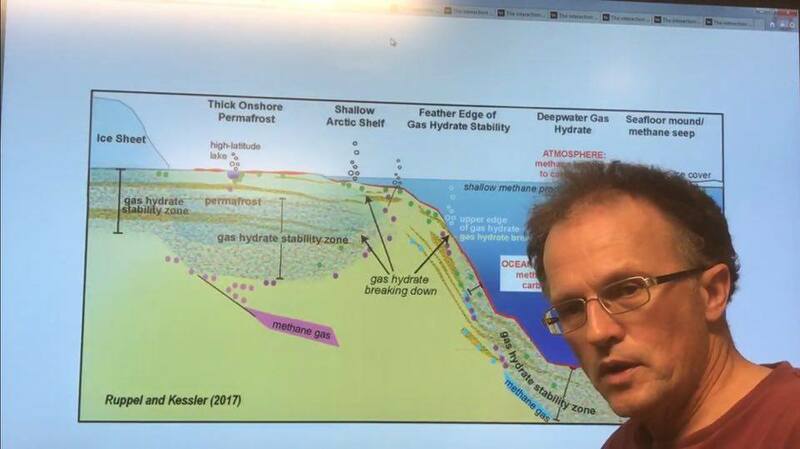 That question is examined in great detail in a new paper by the United States Geological Society (USGS), ‘Gas Hydrate Breakdown Unlikely to Cause Massive Greenhouse Gas Release‘. I discuss the key points from this paper, and assess what these findings mean to overall abrupt climate system changes. Guy McPherson keeps moving his expected Near-Term Human Extinction (NTHE) date closer and closer. His latest claim is 9 years from now; namely by 2026. I disagree with this premise. There is no scientific validity to these claims. No chain of logic leading to this conclusion. They are one persons “opinion”. To call them “fact” is absurd. They are opinion. We need to talk “probabilities”; not absolutes. I asked online in jest if he has “fallen off his rocker”? He called me a “jerk”. I have been called much worse. He seems to be absolutely intolerant to any ideas that oppose his own. He puts himself on a pedestal, beyond tolerance of any criticism. That is not science, it is something opposite to science. In a few months he will be saying that 7.5 billion humans will be dead by next year. Or perhaps even by last year?! This entry was posted in New Video, Uncategorized and tagged New Video, z Methane Clathrate Gun. Bookmark the permalink. 10 Responses to Methane Clathrate Gun: Pea-shooter or Bazooka? You’re stuck in your Uni model chart world, Paul! It’s not the real world, GM is far more accurate than your Uni BS. What’s happening is far beyond your academic blurbs! Actually, he’s changed the date again, Paul. It’s the only way for him to garner attention. Dr. McPherson is now predicting that human extinction will occur within 18-42 months from now, based on the probability of giant methane “burps” due to the warming of the Arctic Ocean and Permafrost. Methane is a greenhouse gas that when forst emitted, is 100x more powerful than CO2 in trapping reflected sunlight, and this will result in a rapid temperature rise of over 1 C within a few days or months. This will result in a collapse of civilization because grains will not grow. The collapse of civilization, in turn, will result not only in a reduction in emissions of CO2 and other greenhouse gases, but also a reduction in the particulates that are also emitted in the burning of fossil fuels and reflect incoming solar energy back into space, the so -called “global dimming” effect, and the reduction in global dimming will cause the global temperature to rise even faster. The 18-42 month range in the timeline reflects the uncertainty as to just when the Arctic Ocean becomes ice-free, based on the prediction of the US Naval Postgraduate School in 2013 that it would occur in 2016 +/- 3 years. For the research Dr. McPherson is using as the basis for his prediction regarding emissions of methane from the Arctic Ocean and Permafrost see the first Self-Reinforcing Feedback Loop here: The document also contains 68 other self-reinforcing feedback loops, all of which have a multiplicative effect in that they also reinforce one another. GM tends to expound other peoples work, then extrapolate between those works, rather than letting the people who put together the data do so. I think he started with a conviction that he was doing the right thing but when questions regarding his conviction arise I guess personal motives comes to play and he gets defensive as most other humans react (including myself). I have not heard the scientists draw conclusions outside their own papers. Meaning using the new knowledge to extrapolate a future using older papers as some kind of basis for a model of how the future will look like. Maybe the reason to that is that it is just too hard and chances are that one will simply jump to the wrong conclusions. Once someone announces sensational claims which are found to be wrong it will kind of get hard to get rid of the attributed ridicule. So they keep a conservative approach to avoid getting defamed. I think that a lot of people today are aware of the climate issue but they tend to jump to whatever conclusion which will keep their lifestyle unchanged unless the consequences will hit them up front. I still think that the only right thing to do for you is to keep up the science and only predict things that are reasonable within the limits of known and verifiable data. When the truth is told to people and they can confirm it the ones who deliver the information will perhaps get increased attention. But I won’t bet that people will change at all even if they know the truth… That’s another matter. I’m not quite sure why my previous comment hasn’t been posted, but to clarify, I feel McPherson is making new predictions simply to remain seen in the public eye, to appear relevant. Here is the explainer article about the mass extinction study. “The study “shows without any significant doubt that we are now entering the sixth great mass extinction event,” co-author and Stanford University professor of biology Paul Ehrlich said. Here is the peer reviewed paper. Sounds to me like the experts are saying change or die/go extinct. The woman who headed up the project is not all there when it comes to logic. The contention that they do not know where the massive release of Methane in the Arctic is coming from but it has not been linked to the Methane Clathrates. Well, she has a choice it is either the permafrost rapidly melting on land in winter or it is from warm waters making contact with methane clathrates on the sea floor. Since that has already been verified by numerous researchers in the past I would choose the sea floor. An exciting and incredible report for the climate scientists that should know it! I know that in this case you do not have any expertise. The impact of this new discovery is extremely important in climate change. THE DISCOVERY OF A NEW SCIENTIFIC FORMULA AND HOPE TO SAVE THE EARTH’S ENVIRONMENT! A NEW SCIENTIFIC FORMULA DISCOVERY TO CONTROL OF CLIMATE CHANGE!